Once with mediAvatar iPhone Transfer for Mac, iPhone management on Mac becomes much easier than ever before. This Mac iPhone copy software makes it possible to back up iPhone music, videos, photos and movies shot by iPhone 4S itself to Mac and copy files from iPhone to iTunes. 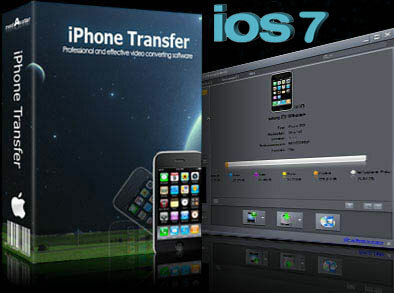 And just like iTunes but easier than iTunes, this iPhone rip software also supports file transfer from Mac to iPhone. Supporting all iPhone types (CDMA iPhone, iPhone 1gen, iPhone 3G, iPhone 3GS, iPhone 4S, iPhone 5, iPhone 5s, iPhone 5c, iPad Air, iPod touch, iPod touch 5 and iPod nano 7), mediAvatar iPhone Transfer for Mac makes your iPhone a portable hard disk by opening it with Finder. Using the Mac iPhone rip software, you'll find that managing and transferring iPhone playlists, searching and grouping iPhone files are so simple. Transferring files from iPhone to Mac for backup happens to be possible. You can even export movies shot by iPhone to Mac computer now. It's asier than iTunes to transfer music, videos and photos from Mac to iPhone. Transfer apps between Mac and your devices, you can also manage documents for some apps which support this operation. Easily copy all music, videos and photos from iPhone to iTunes on Mac to enrich your iTunes library. Allows you to connect multiple iPhone and iPod devices simultaneously, thus share movies, music and photos in between. Once your iPhone is inserted, this iPhone transfer software Mac will recognize its device information and show its picture, type, capacity, version, etc. on the interface. Delete, create, edit and transfer iPhone playlists via mediAvatar iPhone to Mac Transfer simply. In iPhone to Mac transfer, your music is organized much as it would be in any other music player: by artist, genre, album, song, or playlist, which is really handy for users. Allow you to check music/movie file info and edit the ID3 tag of music file to help you manage and group your music. ITunes style interface, sound button design, and drag-and-drop supporting make the program pretty easy to use. File transfer between iPhone and Mac, or among several iPhones can be finished in a wink. Transfer any videos and audio files to iPhone on Mac, also backup iPhone movies and music to Mac or iTunes library.